All in all, I think this one exceeded my expectations. I was hoping that this season would be just as good as the first one, but it ended up to be much better. The storylines are much more interesting - for the first season I thought that the topics still had room for improvement, although I was already impressed. I liked the fact that more screen time was devoted to the third years. Back in the first season, they weren\'t given their share of the lime light, except maybe for Sei. Eriko even got an episode that was devoted to her life. Sadly though, we have to say goodbye to the grande soeurs. There were new characters that were added, like Noriko and Touko. I\'m not so sure if I\'m happy with Touko being there. Shimako was also given a lot of chances to grace the scenes. There were many episodes about her. Thank goodness for that as well - I think she deserved a lot of screen time.I was also glad to see Sachiko in a different light. We see her family and how she is at home, we get to see her laugh for the first time (I think) and she is also able to reaffirm the relationship she has with Yumi. I was also able to get more laughs from this one compared to the first season. This was all due to Yoshino, who is both adorable and funny. The music was better this time around too. They finally added words to the opening theme, which made it more worthwhile, but I still find myself skipping it even with the words. It was still a bit boring. Same goes for the ending theme. I hadn\'t mentioned this in my review of the first season, but although the anime is considerably well drawn, the characters illustrations did have some problems sometimes. The characters, specially the really tall Rei, tend to look really long and stringy, almost like a stick drawing. There are also occassions when their faces change. Other than those, this anime is still very good. I was almost sad that I finished it too soon. I really didn\'t want it to end, and I hope there will be a third season. It is a shame the decision was made to split the first 26 episodes of Maria-sama ga Miteru into two separate installments, because it is in the second season that Marimite really finds its stride. Although the second season is a bit late to be making the realization, it must be said that it was not until this arc that I properly realized Marimite for what it is, or rather, what it wasn't; This is not a yuri anime. 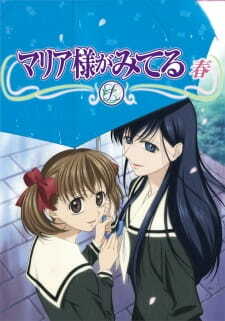 The story here is one of intense and lasting friendships, although it draws upon an old idea in Japanese culture; class S relationships and psuedo-romantic interludes between adolescent women are ideas that have had traction for awhile, and it is this rather than a direct lesbian theme that MariMite is shooting for. The characters of Marimite are well-developed and likeable, but as an entirely character-driven story your enjoyment of the plot rides heavily on your attachment to the members of the Yamayurikai. It was in the second season that this attachment came for me- through more exposure, but also the season's wise decision to give a closer look to characters other than Yumi and Sachiko. Shimako's arc in particular was beautiful and moving, and was an excellent expansion of a character who went through the first season comparatively underdeveloped. While characters are this show's strongest offering, they are not necessarily believable characters. Rather, they are idealized young ladies: conspicuously absent is sexual desire and romantic drama, cellphones, texting and malicious gossip, or a burning preoccupation with the opinions of their peers. Instead the viewer sees a refined and composed cast that have believable human traits and problems but at heart represent ideal maidens. Sachiko and Shimako in particular may not exist beyond the realms of fantasy, but this is ameliorated in part by choosing as a protagonist Yumi, a more relatable outsider to the world of refinement and grace that is Lillian Girls Academy. This is a show that begs for a cup of tea and a comfortable place to sit. It can be made into an experience, an isle of calm and quiet, and I found myself intentionally slowing the pace I finished the season to savour each episode and the feelings of well-being and tranquility it generated. The second season of Marimite was a couple notches more enjoyable for me than the first, and I would recommend as strongly as possible that anyone who enjoyed, or indeed finished, the first season watch the second. I would go so far as to recommend watching the first for the sole reason of setting up the second season, in fact; taken by itself, the second season of Maria-sama ga miteru is one of the most enjoyable anime I have seen. After watching the first season of Maria-sama ga miteru I wanted to know more about the characters of the series. Thus I was relieved after having finished the second series and found that it met my expectations. The series continued at the same time to have the same easy-going pace and subtle feeling to it which I enjoyed from the first season, thou in one way it went a little more on the serious side storywise. This might not be enjoyed by all viewers who has seen the first season but I don\'t think it ruined the experience for me. Great continuation and great viewing value! This is the sequel of Maria-sama ga Miteru, about the all-girl-school Lillian academy and its students. It continues straight of from where the first season ended, with pretty much separate episodes about the different girls. This time even more of the girls get their back stories explained, and there is quite a bit drama in this as well. Every episode was good and the last three specially. The last episode is perhaps one of the best final episodes I&rsquo;ve ever seen. The show really played on some of my heartstrings all the way, and it was really well made. Looked a little better than season one, but still wasn&rsquo;t super. Character designs were good, and the characters looked cute. The design for Yumi is just great. Still I felt something lacked. OP and ED are the same as the first season, and they didn&rsquo;t please me that much. Background music consisted of classical themes, and they contribute much to the general feel of the anime. It isn&rsquo;t music I usually like, though. Voicing was good, with starring many good actors. Characters are the same as in season one, plus a few new ones. The old ones are great (many of who get episodes dedicated to them, many nice back stories). I also got my dose of Sachiko x Yumi, who got some nice moments. I liked the new characters, especially Noriko, and the characters remain as Maria-sama&rsquo;s best field, and that&rsquo;s good, since the show is pretty much a character drama. It was a nice watch, not as good as the first season though. The series still had plenty of humour and drama, and I liked it very much. But I didn&rsquo;t quite enjoy it as much as I&rsquo;d liked to. I&rsquo;d put this behind season one by a little margin, but it still was a really good show. The only major con is that it&rsquo;s a little too alike too the first season, but I guess that was the intention, they aired relatively short after one another. If you have watched Maria-sama ga Miteru, pick this up, since it&rsquo;s more of the same really.